Combine one pound of your family’s favorite short pasta shape—Rotini, Penne, or Farfalle all work well—with 1 6.3-ounce jar Barilla Basil-Pesto Sauce and 2 cups petite peas. Serve at room temperature for a simple salad everyone will love. Nutrition facts, per 1-cup serving: 308 calories, 10 g protein, 48 g carb., 9 g fat, 299 mg sodium, 4 g fiber. Stir one pound Barilla Fettuccine with 1 6.3-ounce jar Basil-Pesto Sauce and the juice of 1 lemon. Toss with quick-roasted cut asparagus and serve at room temperature topped with shredded Parmesan cheese and lemon zest. Nutrition facts, per 1-cup serving: 335 calories, 10 g protein, 46 g carb., 13 g fat, 340 mg sodium, 4 g fiber. A pound of Barilla Farfalle pasta, 1 cup crumbled feta cheese, 1 cup pitted and halved kalamata olives, 1 cup halved cherry tomatoes, 1 cup sliced and halved cucumbers, and 1 cup Barilla Marinara Sauce transform basic ingredients into a satisfying dish to share. Sprinkle with cracked black pepper and serve warm. Nutrition facts, per 1-cup serving: 252 calories, 8 g protein, 38g carb., 8 g fat, 539 mg sodium, 2 g fiber. Combine one pound of Barilla Elbow Pasta, 2 15-ounce cans rinsed and drained black beans, 2 cups thawed frozen sweet corn, and 1½ cups warmed Spicy Marinara Sauce. Serve topped with 1 cup shredded Mexican-style four-cheese blend, 1 sliced avocado, and crushed yellow tortilla chips. Nutrition facts, per 1-cup serving: 292 calories, 13 g protein, 51 g carb., 6 g fat, 368 mg sodium, 7 g fiber. 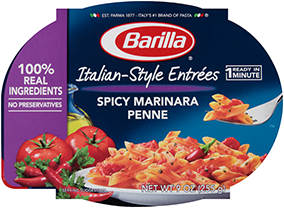 Stir together one pound of freshly cooked Barilla Penne pasta with 1 cup Barilla Tomato-Basil Sauce. Add 2 cups finely diced zucchini, 2 cups chopped fresh tomatoes, 8 ounces bite-size fresh mozzarella balls, and ½ cup freshly chopped basil leaves for a tastes-like-summer dish that your family will love all year long. Serve warm. Nutrition facts, per 1-cup serving: 241 calories, 11 g protein, 39 g carb., 5 g fat, 154 mg sodium, 3 g fiber. Add more flavor to tonight’s dinner with this easy method: Toss 6 cups of your family’s favorite veggies—zucchini, yellow squash, broccoli, and/or cauliflower—with 2 tablespoons olive oil and a sprinkle of salt. Roast at 400°F for 15-18 minutes or until tender, then toss with one pound of Barilla Penne or Rotini Pasta and 8 ounces diced smoked mozzarella cheese. Nutrition facts, per 1-cup serving: 266 calories, 12 g protein, 37 g carb., 9 g fat, 211 mg sodium, 3 g fiber. Super fresh summer corn—or frozen thawed sweet corn—doesn’t need much to make it delicious. Toss 4 3 cups sweet corn with one pound of Barilla Spaghetti, 1 6.3-ounce jar Traditional Basil Pesto Sauce, and 1 cup crumbled goat cheese. Gently stir in blueberries and top with ½ cup crumbled goat cheese for a spaghetti salad to remember. Nutrition facts, per 1-cup serving: 455 calories, 17 g protein, 61 g carb., 17 g fat, 314 mg sodium, 4 g fiber.